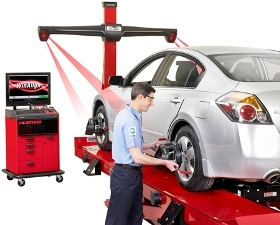 Scheduled Wheel Alignment at Xpertech Auto Repair Inc.
Englewood Florida drivers need to be concerned about wheel alignments for two primary reasons: safety and money. When your wheels are out of alignment, they can pull to one side, maybe pretty hard. A moment of inattention could put you into on-coming traffic on a busy street in Sarasota or completely off the road. And a bad alignment will chew up your tires very quickly. We had one guy in our Englewood FL. auto service center who said his wheels were a little out of alignment before a family vacation, but he didn't think it was that bad. So he didn't take care of it before he left. A couple of long days of highway driving and his front tires were worn down to the cords. He had to take a half day out of his mountain vacation to find a rural town in Florida big enough to have a tire center for replacements. 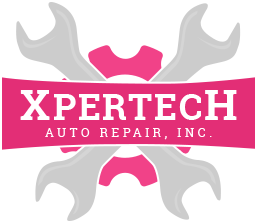 Part of the alignment service at Xpertech Auto Repair Inc. is an inspection of the steering and suspension components. Whatever caused the wheels to be knocked out of alignment in the first place may have also damaged important parts. So we want to be sure to replace broken or bent parts as needed. The process corrects alignment of each wheel along three axes (toe, camber and caster) as well as front to rear alignment.